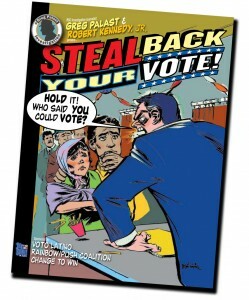 More Political Comics – Steal Back Your Vote! Another political comic book is getting distributed, this one called Steal Back Your Vote!, and you can download it after you donate something via paypal (as little as a dollar). The art is by Lukas Ketner, (who also does this Witch Doctor comic), and Lloyd Dangle, (who has a pretty political comic called Troubletown). There’s actually a lot more text inside than there is comic book, but you can see a couple of example pages on flickr: Vote Theft for Idiots: Lesson 1 and Lesson 2. Completely coincidentally, I have been meaning to post a link to The Pain–When will it end?, which is the site for the (mostly political) cartoons of Tim Kreider. It appears to be updated more or less weekly, and the archives are very definitely worth a look. If I had a complaint though, the images are pretty damn large, and scrolling is not really an option so much as an obligation. Good stuff though.